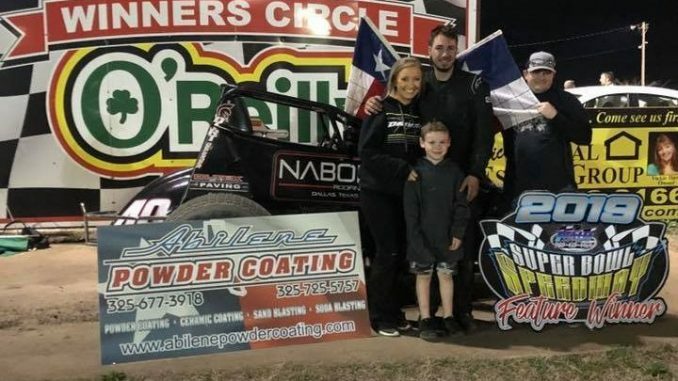 GREENVILLE, Texas (March 23, 2019) – Outrunning the weather at Superbowl Speedway, Justin Fifield captured the win Saturday night with the ASCS Elite Non-Wing Series presented by Abilene Powder Coating. Taking the green from the pole, Fifield held off the charge of open-wheel veteran, Paul White. The triumph marks the second time the Mesquite, Texas racer has topped the ASCS Elite Non-Wing Series presented by Abilene Powder Coating. Making his first appearance of 2019, Weston Gorham completed the night’s podium. Craig Oaks crossed fourth with Bryan Debrick coming from 13th to complete the top five. Johnny Miller in sixth was trailed by Christian Moore. Making the trip from Collinsville, Okla., Craig Carroll wheeled from 18th to seventh with Jarrod Jennings and Michelle Melton completing the top ten. Qualifying was not held due to the threat of rain. The ASCS Elite Non-Wing Series presented by Abilene Powder Coating returns to action on Friday, March 29 at Timberline Speedway in Corley, Texas.